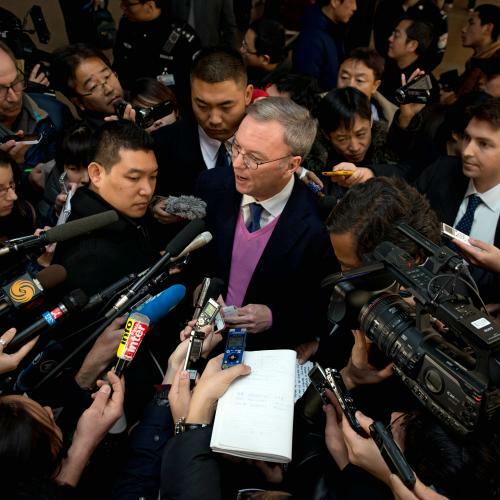 No corporate executive's movements are tracked with as much rumor and fanfare as those of Google chairman Eric Schmidt. When he travels, it carries the import of a state visit; commentators scrutinize his intentions, and how world leaders will react. Such was the case with Schmidt's junket this week to North Korea, which he apparently made at the invitation of ex-governor, ex-diplomat, ex-cabinet secretary Bill Richardson, who was trying to get an American detainee out of the clink. Though Google said that the trip was "personal," the press still wondered what business upside there could be in publicly touring one of the world's most repressive nations. Yes, Google stands to profit from North Korea—eventually. But that's probably not why Schmidt made the trip. Like those of a secretary of state, Schmidt's peregrinations can be split into two categories: Those where he is going to directly negotiate with global officialdom over something that pertains to Google, like meeting with the European Commission's chief antitrust regulator or the president of France. In these cases, especially in Europe, Google is seen as a big American company that's undercutting traditional industries, dodging taxes, and mapping streets without permission. A certain degree of ring-kissing is expected from a company with power these nations deeply distrust. And then there are those that appear simply as goodwill tours, to places like Israel, Afghanistan, and Pakistan, with Schmidt appearing as the Internet's ambassador-at-large. These are missions with a long view—the public diplomacy, the soft power. Visiting censorious nations is a statement that the Internet finds its way across borders, with or without the government’s approval. That’s true even in North Korea, which has broadband Internet but restricts access to an elite few. When citizens do gain widespread access to the Web—which Schmidt argued for while in the country this week—they'll trust Google products to help them navigate it. In the developing world, other tech companies have enjoyed—and lost—this trust. "Cisco was the most loved company, because Cisco was routers, and routers were Internet," says Parminder Jeet Singh, of the Indian nonprofit IT For Change. "Now the routers are censoring content, and all of a sudden you are the bad guys. Right now, Google is on the right side of what is the Internet. All the good things about the Internet is good things about Google." The most puzzling of Google's extracurricular projects is its in-house "think/do" tank, Google Ideas, which seeks technological solutions for the problems of conflict-ridden states. Unlike Google's many research divisions, which often produce innovative products that ultimately fail, it's difficult to imagine any monetization strategy for a group that tries to rehabilitate violent extremists. And yet, it's not lumped in with Google.org's portfolio of charitable projects. To make the enterprise even more perplexing, it's partnered with a group that actively tries to empower cyber dissidents in authoritarian regimes, which a singularly profit-motivated company might leave up to activists, NGOs, and official organs like the State Department. These are not the actions of a chief executive who keeps his shareholders’ interests in mind at all times, as Steve Jobs did. They’re the actions of a company that, by dint of innovation and brainpower, thinks it can make progress on problems that the establishment has repeatedly failed to solve. "They are a more idealistic company," says an industry trade association executive who asked not to be named, mentioning projects like Google Ideas. "I think when they do that stuff, it’s just like a teenager. It doesn’t feel calculated, it feels more rambunctious." So, Schmidt enjoys playing the diplomat. But can he actually bring the Kim Jong-uns of the world around to his way of thinking? I asked Vint Cerf, whose actual title at Google is "chief Internet evangelist," whether he thinks Schmidt, or other free-Internet advocates, have changed the minds of any recalcitrant world leaders. Cerf offered no examples—it’s more a matter of letting time and technology run its course, he said. "As we see people enter into positions of authority in government, whether it's legislative or executive or judicial, if those people arise out of experience with technology, they will be more comfortable with it than many others are today," Cerf said, speaking of governments generally around the world. "This is a changing cohort of people taking policy responsibility. Their attitudes will be different than legislators who grew up in a different time period." So why does Schmidt take these state-like trips? Maybe because he’s an armchair political analyst, or because he figures the Internet needs a spokesman and it might as well be the head of Google, or even because he feels that being an unconventional CEO somehow increases public trust in Google as a company that (unlike, say, Facebook) doesn’t appear obsessed with monetization. Indeed, Google makes enough money, and is positioned to dominate in enough industries, that Schmidt can afford to think about factors that might matter to his company decades down the road. But he also knows that the Internet itself, not high-level missions by CEOs or actual diplomats, is what will eventually shift the world in the way Cerf described. “The hardware and software created by private companies in free markets are proving more useful to citizens abroad than state-sponsored assistance or diplomacy,” Schmidt wrote in a 2010 article, which will serve as a basis for a much-ballyhooed new book co-authored with Google Ideas head Jared Cohen. Arrogant? Sure. Then again, it’s not like diplomacy has gotten us far with North Korea. It might be time for a new approach.